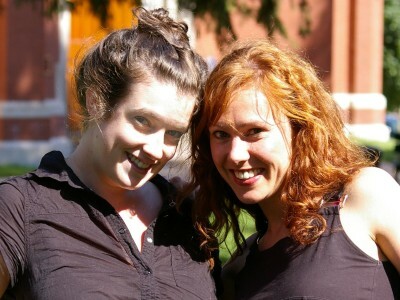 Christel Bartelse and Colleen O’Reilly are anything but chaotic as they discuss Chaotica , a “one woman madcap comedy” which sees its Fringe premiere this week. Although they hadn’t worked together before this show—a mutual friend introduced them when she couldn’t do the project—you’d never know it from the way each of them fill in and play off the other’s ideas and even sentences. The play, which Christel wrote and performs in, marks the “Fringe veteran”‘s debut as a solo performer. A former member of a Toronto-based group called Burnt Marshmallows, she describes the experience of the solo show as an experience with its pros and cons: “It’s really fun and rewarding, and then […] you run off stage and there’s nobody else there.” Stage manager Colleen has been “a huge help” in that respect, as well as in her other roles in the very physical show. Chaotica has three more scheduled performances at the Spriet Family Theatre in Covent Garden Market. Christel Bartelse’s “Intro to Clown” workshop takes place on Thursday from 1:00pm–4:00pm at The ARTS Project. Chaotica is the Impresario show for the Spriet Theatre, and will have an additional performance at 8:30pm on Sunday. See the London Fringe Festival website for advance tickets and more information on the Impresario productions.